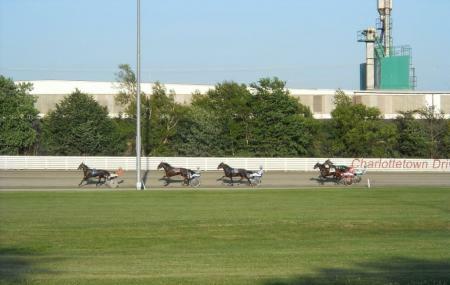 Find hotel near Red Shores Racetrack And .. Whether it's the thrill of live harness racing or daily simulcast action from the state-of-the-art simulcast theatres, the fun of over 200 slot machines, Blackjack or live Texas Hold 'Em Poker tables, trust Red Shores Racetrack and Casino to add thrill and adventure in you’re trip. Gather with friends and family for casual food and drink at Turf’s Bar & Grill or relax under an umbrella and enjoy the best trackside seat in the house at the trackside (seasonal). Experience casual, contemporary dining at the buffet and enjoy sumptuous cocktails that will leave you satiated. It’s all fun and games here! How popular is Red Shores Racetrack And Casino? People normally club together Ardgowan and New Glasgow Highlands Campground while planning their visit to Red Shores Racetrack And Casino. People also prefer to end their day with Red Shores Racetrack And Casino. As the names implies, it is a race track for pony and trap racing. Large shaded grandstand. The main building is deceptive. It has a large restaurant, with the outside tables overlooking the race track. There is a full menu self service buffet. There is a bar with table service drinks. There is a casino, gambling machines. Really nice lunchtime meal. I did not get there in the evening, but as the standard is high, I think it can be assumed that the evening will be enjoyable as well. Had the philly steak poutine at Turfs Bar and Grill. Was tasty and reasonably priced at $9.00. We also had fish and chips which was good and priced at $11.00. Two good meals for $20. Cool place. Awesome food. Buffet is best deal in town. Excellent food. Great view of the racetrack. Buffet style with good prices.